Have you ever knit with a super-saturated, gorgeous skein of yarn, only to look down in horror at your hands and discover that they’ve turned an entirely different color? While dye bleeding might be a shock to those of us who encounter it, it’s a relatively common issue with hand-dyed yarns. Here’s some info on why it happens, and what we can do to anticipate and counteract it when it does. 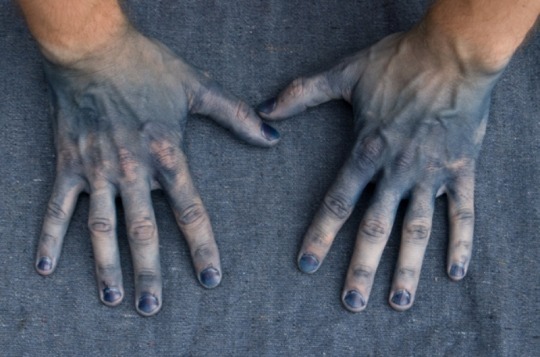 You’re unlikely to encounter this level of rub-off unless you’re a dyer and stick your hands into the indigo vat! Photo from Long John. When dyeing yarn, you have three main ingredients: the fiber, the dye (which is a combination of water and the actual dye stuff), and a fixative. These are all combined with heat to join them together. Many dyers we feature use acid dyes, called that because they affix to the protein fibers (like wool) using an acid as the fixative. The most common acid used is citric acid. When mixing a dyebath, the dyer has to estimate the amount of dye needed to create the color and fix it to the yarn. Ideally, every bit of dye will attach to the yarn, leaving the dye bath clear at the end. In small batches, this is easy, but in large scale production, it can be a bit more difficult to get it right every time. Add the need for highly-saturated colors in strong tones like blues, purples, and reds, and sometimes you’ll have dye that doesn’t fully attach. The next step for dyers after the yarn has been dyed is usually a good rinse. With strong colors, sometimes two or three rinses are required to fully get the yarn clean. Again - this becomes more time consuming with larger orders, so most dyers will rinse a max of two times, then dry the yarn. Sometimes, a skein or two might slip past with a few dye molecules still attached. It is hanked, labeled, and shipped out, and the knitter discovers these dye molecules mid-project or while winding the yarn! Usually what rubs off is fairly minimal, but there is always a slight worry that it might stick to your clothes or the upholstered chair you knit in. There are a few things you can do to counter-act the chance of that happening. If you notice some rub-off while winding your yarn, stop immediately and re-skein it, then rinse the looped yarn (untwist the hanks) in a bath with warm water. Leave it for about thirty minutes or until the water cools, then move your project to the side and take a look at the bath. If it’s mostly clear with just a tint of color, you probably don’t need to rinse more than once. If it’s very saturated with dye, you’ll want to refill the bath and repeat the process. If you’ve already started knitting with the yarn, and you don’t want to unravel your project mid-way, you have two options. One: deal with it and keep knitting, then rinse the final project. This is the easiest but will require you to think about what you’re wearing and sitting on while working. The other option is to thread a lifeline through the stitches on your needle (using a non-grabby waste yarn), then wind the rest of your yarn back into a hank loop. Make sure you add ties to keep the yarn from tangling, and plunk the whole thing into a tub or sink of warm water. You might hear that you should add vinegar, but really it’s not going to do anything unless you’re actually setting the dye with heat, so if you hate the smell, leave it out. Let is soak for about thirty minutes or until the water cools, then move your project to the side and take a look at the bath. If it’s mostly clear with just a tint of color, you probably don’t need to rinse more than once. If it’s very saturated with dye, you’ll want to refill the bath and repeat the process. If your yarn won’t stop bleeding after being rinsed, there’s a chance that your skein may not have been set properly. It’s time to reach out to the dyer and see what they recommend - nobody will know their product as well as they do! Sometimes the price of beautiful, saturated, hand-dyed yarns is a little extra work (but we think it’s worth the result)!